I’ve always been a big fan of cartoons, from the homely and hilarious, to the provocative and poignant. One of the ones I used to read regularly was Calvin and Hobbes, the tales of a mischievous young boy and his tiger friend that only Calvin can see. They even made a previous line(s) of the day. Here are eight of my favourites. Which ones stand out to you? And if I’ve swayed you, you’ll find more here. This entry was posted in Gr8at and tagged alex raphael, alexraphael, calvin and hobbes, cartoons, child humour, cute tiger, tiger by alexraphael. Bookmark the permalink. Such a great cartoon 🙂 Really beings back a lot of memories. I like the breakfast in bed one, because it shows he tries his best. I love the last one, because that is so much like my kid, then and now. Ha. How good are your kitchen skills? Lovely! Calvin & Hobbes are my favourites 🙂 Think I might have a look at an album later on! Hahahahha! 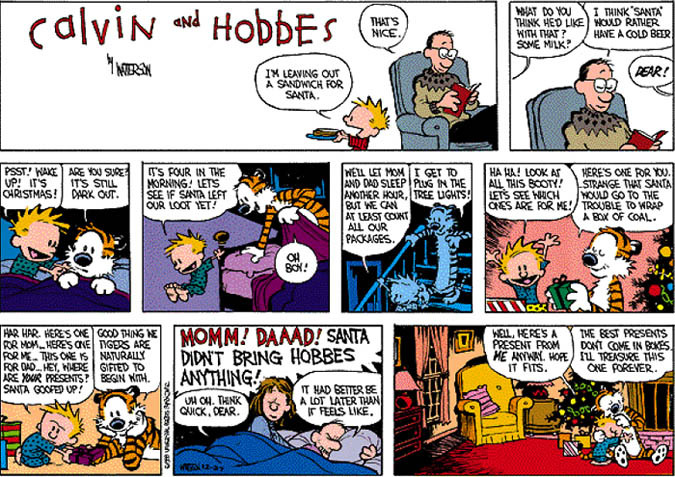 I love Calvin & Hobbes! Ha! I love the conversations with his dad too, especially the ‘dad polls’. A day can really slip by you when you’re avoiding what you need to. It really is. So many fond memories of reading it.